Appellate Courts: The appellate courts are divided into 7 appellate circuits. The Court of Appeals and the Court of Special Appeals are located in Annapolis - Anne Arundel County. Circuit Courts: The circuit courts are divided into 8 judicial circuits with a court in each of the 23 counties and Baltimore City. 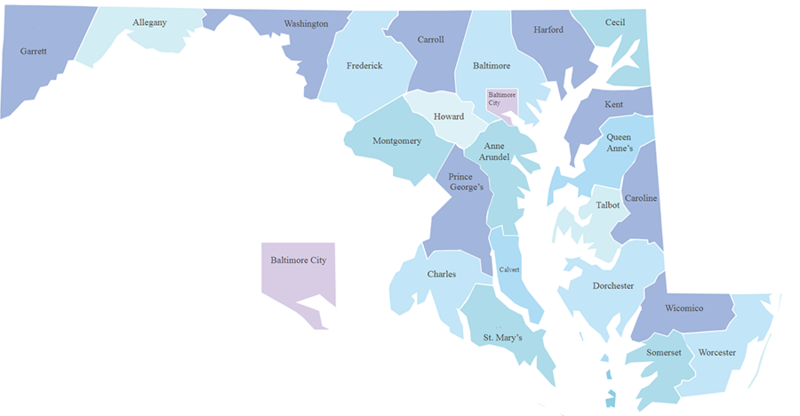 District Court: The District Court has 34 locations in 12 districts statewide, with at least one judge presiding in every county and Baltimore City. 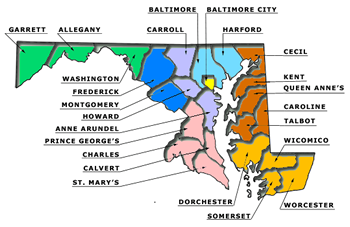 Orphans' Court: There is an Orphans' Court in each of the 23 counties and Baltimore City. Note, judges of the Circuit Court in Harford County and Montgomery County preside over the Orphans' Court in those counties. More information for each Maryland court can be found by hovering over and clicking on each county on the map below or using the links in the left menu column.